Were any events from the movie later referenced in-show? Could we say the movie took place in another universe parallel to the TV show's universe? What happened before the events of the movie? How similar was this universe's history to the show history? What happened after the events of the movie? How similar was this universe's future to the events of season 3 and beyond? Why did certain names change between the movie and the series, such as Tengu to Tenga and Ninjetti to Ninja? Do Ivan Ooze and Dulcea exist in the TV series? Like, hypothetically? What did Ivan do to the world before he was imprisoned? Were Rita and Zedd married in the movie? Where did Mordant come from? Where were Finster, Squatt, and Baboo? What was the Order of Meledon? What did the Ninjetti powers do, anyway? 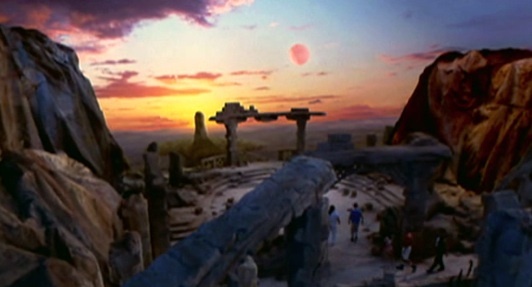 Curiously, the moon palace in the comic book adaptation appeared nearly identical to the version from the TV show rather than the one seen in the movie. 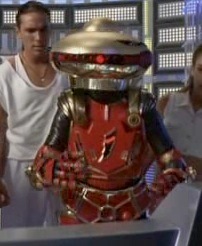 The comic book versions of the Command Center, Zordon, and Alpha, however, more closely resembled the movie versions. Curiously, the Ninjazords in the comic book adaptation appeared nearly identical to the versions from the TV show rather than those seen in the movie. Workers at a construction site unearth Ivan Ooze's hyperlock chamber. Zordon dispatches the Rangers, but Zedd has already freed Ivan when they arrive. While the Rangers fight ooze warriors, Ivan ransacks the Command Center. The Rangers lose their powers and return to find Zordon dying. Alpha teleports the teens to Phaedos in search of the Great Power. Soon, Ivan imprisons Rita and Zedd and begins producing mind-controlling ooze in Angel Grove. His Tengu Warriors catch up to the teens on Phaedos, but Dulcea comes to their aid and introduces them to their animal spirits. The spellbound parents of Angel Grove, meanwhile, unearth the Ecto-Morphicon Titans for Ivan. Following encounters with living dinosaur skeletons and stone golems, the Ninjetti teens acquire the Great Power and return to Earth. 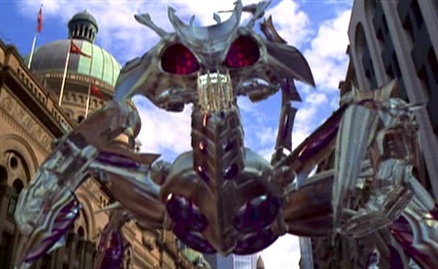 They use new Ninjazords to destroy Scorpitron, but Ivan merges with Hornitor. 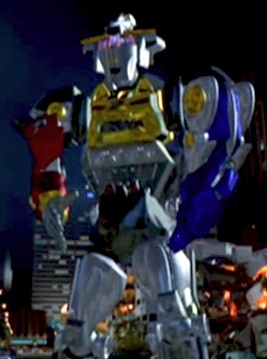 Bulk and Skull aid Fred Kelman in saving the parents of Angel Grove, and the Rangers use the Megazord to knock Hornitor-Ivan into the path of an approaching comet. 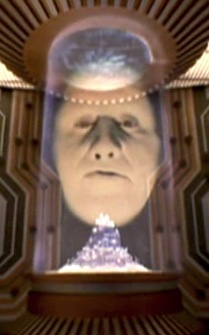 The Rangers then use the Great Power to restore the Command Center and revive Zordon. As Angel Grove celebrates, Fred considers his future as a Ranger. 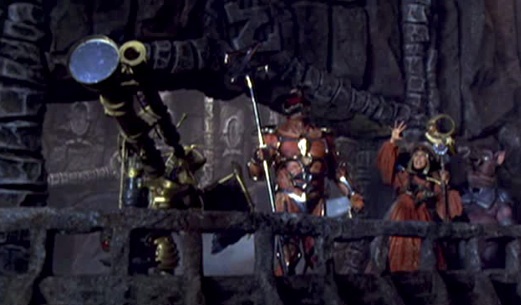 Rita and Zedd return, furious with Goldar and Mordant's treachery. The Rangers lose their powers to a new enemy (Ivan Ooze vs. Rito Revolto). 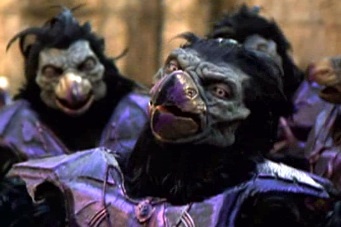 This enemy also produces (or brings) new birdlike foot soldiers (Tengu vs. Tengas). The Rangers seek new powers from a new mentor (Dulcea vs. Ninjor). They gain a new battle form (Ninjetti vs. Ninja Rangers) as well as Ninjazords. Note, however, that the movie served as the first mention of the term "Zordon of Eltare"; it wasn't until "Shift into Turbo" that the TV series confirmed Eltare/Eltar as Zordon's home planet. 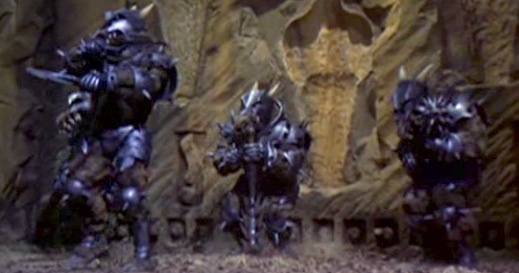 Also, as a curious bit of real-life trivia, the rat monsters in "Return of the Green Ranger" were actually costumes created for the movie but discarded in favor of the ooze warriors. That's one common interpretation among fans who don't wish to ignore the movie outright, but the show has never referenced (nor ruled out) another universe in which events from the movie took place. Unknown, except perhaps for real-life legal reasons. That's entirely up to the imagination of the viewer, but note that real-life legal reasons will probably prevent movie-original characters such as Ivan and Dulcea from appearing in the show (or being mentioned?) in the foreseeable future. "He rid planets of their adult populations, then brainwashed the young to follow in his evil path!" In the final version of the movie, there was no evidence particularly for or against their being married (as opposed to merely being a duo of some sort). In early script drafts, however, Rita noted having been warned by her mother to consider "throwing in the towel" after 89 marriages, and Zedd swore, "This is the last time I marry a witch." Also, Zedd did describe Rita as his wife in the movie's comic book adaptation. His origin wasn't mentioned in the final version of the movie. 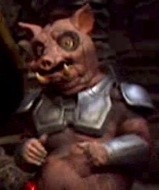 In early script drafts, he was described as a "short, fat, furry creature" whom the Tengu could carry around in their talons; when Rita asked Goldar where he'd found the "rabid little rodent," Goldar replied Mordant was his "second cousin three times removed on [his] mother's side" and said he was just visiting for the summer. If they even existed in this particular universe, they weren't mentioned. 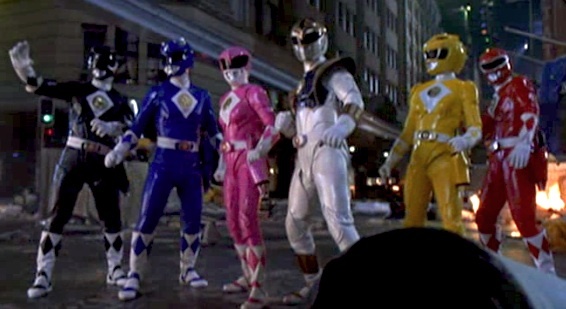 This "Order" was not mentioned in the final version of the movie, except that the group who lured Ivan was, as Zordon told the Ranger teens, "a group of young warriors like yourselves." 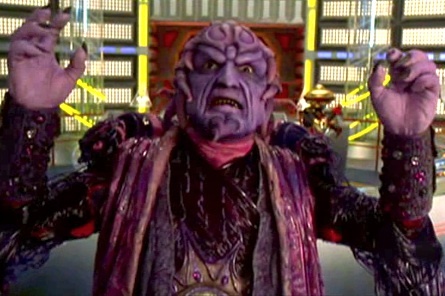 Dulcea's on-screen concern for Zordon and disgust toward Ivan Ooze weren't elaborated upon. 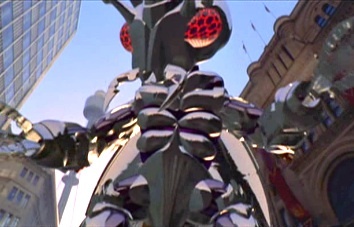 In the early drafts, the Nathadians were a people from "another time, another dimension" who brought the Great Power and placed it in the monolith (called a "Nathadian monolith" in the script) to keep it from their enemies; for thousands of years, Dulcea said, "beings from all over the universe [had] tried to obtain it," but all perished. Dulcea later revealed herself as the sole living descendant of the Nathadians. The Nathadians were not mentioned in the final version or in the TV series. In the final version of the movie, Dulcea planned to call upon the "sacred animals of the Ninjetti," later telling the Rangers, "buried deep within each of us is an animal spirit waiting to be released." She noted that "to be in harmony with the sacred animal spirit is to have the force of the Ninjetti," adding that "to those who are Ninjetti, anything is possible." Further, the temple ruins where the teens slept were described as the "ancient ruins of the Ninjetti temple." In early script drafts, however, Dulcea revealed Ninjetti to be "the genesis of what you on Earth have come to know as the ninja"; it was "the perfect union of mind, body, and spirit." In the Nathadian language, "Nin" meant "man," and "jetti" meant "animal"; thus, the term described man and animal together as one. Dulcea warned that without the Ninjetti, the Great Power would destroy them. The term "Ninjetti" was not mentioned in the TV series (but "the power of Ninja" was mentioned by Ninjor). In the movie, the Ninjetti-clad Rangers didn't appear to have any special powers, aside perhaps from Tommy's diving "Ninjetti corkscrew kick." (Oh, they were also able to don their masks in a flash.) 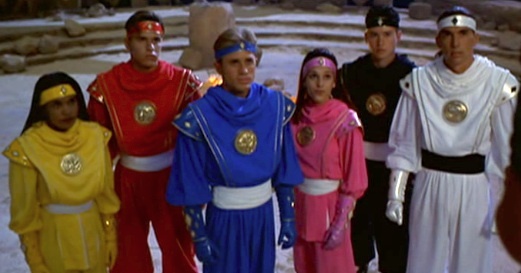 Whether they had additional powers akin to the similarly-costumed Ninja Rangers from the TV series wasn't revealed. "Snoggle" was the name of an alien creature who served as Dulcea's friend and/or pet in early drafts of the movie. Snoggle was described as "ant-eater like." 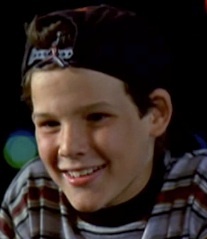 He was scripted to speak in an alien language and produce sugar cubes from his "flubbery looking" snout. A Snoggle prop/costume was actually used in filming certain scenes with a different actress as Dulcea, but all of these scenes were eventually reshot for the final version of the movie.